Get your kindergartener to stop and smell the roses with this coloring page that gets him thinking about his sense of smell. 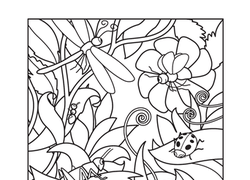 Coloring Page: Bugs in Nature! Kids who love creepy, crawly things will truly enjoy this prekindergarten and year one science-themed coloring page. 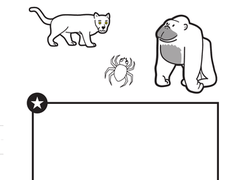 This worksheet introduces the colour red to preschoolers using commons items and animals! Circle and colour all the pieces that Jenny might need for a day of sun and sand. Who knew that so much cuteness could be squeezed onto one page? Give your little fawn or joey a fun coloring page to help him learn the names of baby animals. 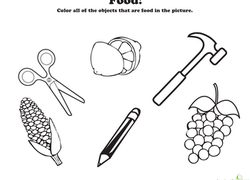 Help your preschooler pick out the things she can eat with this categorize and colour worksheet. You child will practise her shape recognition and her fine motor skills with this fun worksheet. 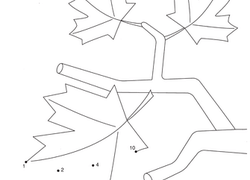 Dot-to-dots are always fun, but this one sneaks in a fact about trees and fall for that extra bit of science learning.